Instruments for astronomy, time-telling, surveying and drawing illustrate the mathematical culture of Italy in the 15th and 16th centuries. Leonardo would have been taken for a ‘mathematician’ as the term was understood at the time. 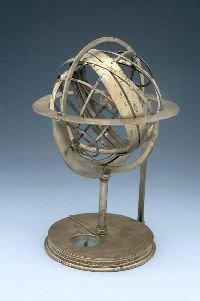 The display shows what this meant in the period, and how Leonardo both worked within and moved beyond the accepted understanding of ‘the mathematical arts.’ The museum's outstanding collection of mathematical instruments from that period will help to illustrate the innovative achievements of the time. The exhibition is part of a larger itinerary around Oxford, entitled Leonardo and Oxford: Discovering the World of Leonardo in Oxford’s collections. Other Oxford museums participating in the itinerary are Christ Church Picture Gallery, The Ashmolean Museum, Magdalen College and The University of Oxford Botanic Garden.